Grub is a thoroughly meditative work on the nature of today’s writing and publishing industry. Though her characters are at best, pretentious, they are also charming. 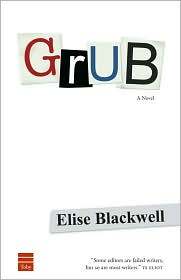 Grub is a quick read and yet, like a good wine, lingers long after it’s gone. Though she begins her book taking the middle path between commercial success (e.g. the sell-out) and literary reputation (e.g. the novelist with five unpublished manuscripts), Blackwell ultimately takes a side. Commercial success becomes the victor in this streamlined book. Most students of writing are taught, however subtly, to value quality over quantity, literary acclaim over popularity, personal success over money. At the conclusion of this rendition of Grub (a modern retelling of Gissing’s New Grub Street), I’m left to wonder whether one is necessarily the antithesis of the other. The characters that pursue commercial success, writing for the masses and the market, end up wealthy, successful, and happy. The characters that pursue a sort of “writing of integrity” are not so lucky, yet are nonetheless happy. One gives up fiction writing entirely, in favor of poetry (yet another subject for analysis) and the other lives dirt poor, the epitome of the starving artist. This latter character also ends up risking his life to save his unpublished manuscript which ultimately becomes a flop. And finally, the last of the central characters, burned by writing what was apparently considered “too literary of a novel”, ends up in rural Illinois, teaching. When painted in such stark terms, is it any wonder two of the characters “sell-out” and choose commerical success? Wouldn’t you, if you could be successful AND a writer? Less and less people are reading these days. Even less bother to pick up physical books at the bookstore, downloading instead onto Kindle or Nook or simply just reading online. Even audio books are gaining in popularity. So what does that mean for today’s writer? In a world of increasing instant gratification and technological gluttony, if you want someone to read your book you’ve got to really hook them. Hard. Gone are the days where people spend hours browsing local bookstores or used book havens. With the folding of Borders and Barnes & Nobles’ own rumored financial worries, the aisles of chain bookstores bear a closer resemblance to a sort of tomb, a remembrance of the glory days of print publishing. If someone is reading a book, it’s usually because they picked it up on the bestseller stand at some airport, someone recommended it to them, or the movie came out last week. Is print publishing dead? I hope not. But it’s not the same as it once was. Every market has to grow up and the book market is no different. People have greater choice than they ever did before. If you want to sell your product, you’ve really got to sell it. You need to convince them that your product is infinitely better than the hundred other similar products available. When people buy your product, it’s because they’re confident in you, in it, and in their future enjoyment. This is commercial writing. Does that mean that we should give up writing books for their literary merit? Of course not. But writers and their values need to evolve. Your novel may be as great as a Tolstoy masterpiece, but few people are reading anything at all, let alone anything that takes a real literary appreciation and determination to plow through. I’ve read War & Peace; how about you? No? Congratulations, you’ve just landed squarely in the vast majority. When I tell people I’m a writer, that I study literature, that I read a lot, that I’m writing a novel, they invariably ask: what do you like to read? As if my opinions should matter more than theirs. But for all my education for all my reading, what it really comes down to is: Everything. I have no standards, no snobbish tendencies. I liked the whole Twilight series. I also like Harry Potter. Jane Austen was a fabulous writer. Ripping into a new Jodi Picoult novel is like sinking your teeth into the first baked goods of fall. The adventure series’ of Douglas Preston and Lincoln Child enrapture me. I also like the Gossip Girl series. And the Pretty Little Liars series. In the whole of my life of readership, I can maybe point at a handful of books I didn’t like. In some cases, that displeasure I felt can surely be attributed to not being of the right age and/or state of mind to enjoy the book properly. Novels are good, bad, great, excellent, or simply mediocre. But what do they all have in common? They have a target audience. And that’s who you’ve got to write to. Today, writing is less a noble art and more a direct plea to the human population not to give up on reading, not to give up on novels, and their authors. To convince people to keep reading, you have to offer something better than constant tweeting, Facebook updates, or online television streaming. You have to remind them why books are worth it. Even if you have to slug them over the head with one.